In the future, all cities will look to the Masdar Development as an example of sustainable excellence. As the center of the development, the Masdar Headquarters Building will be the benchmark of performance for the entire city. 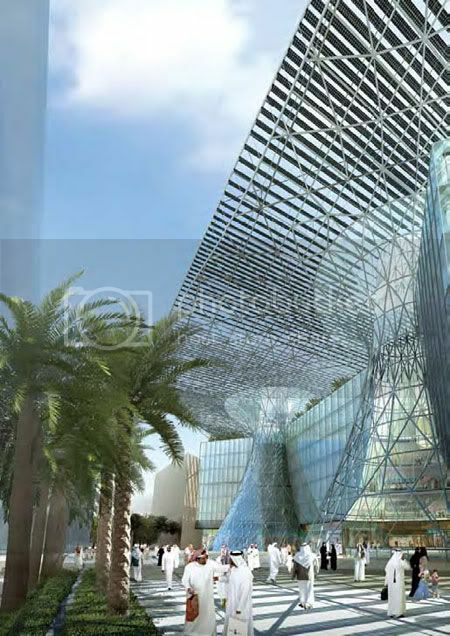 When to visit: Masdar City will be constructed over seven phases and is due to be completed by 2016. 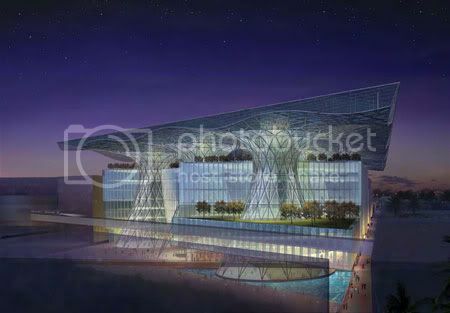 Masdar’s headquarters is part of phase one and will be completed by the end of 2010. 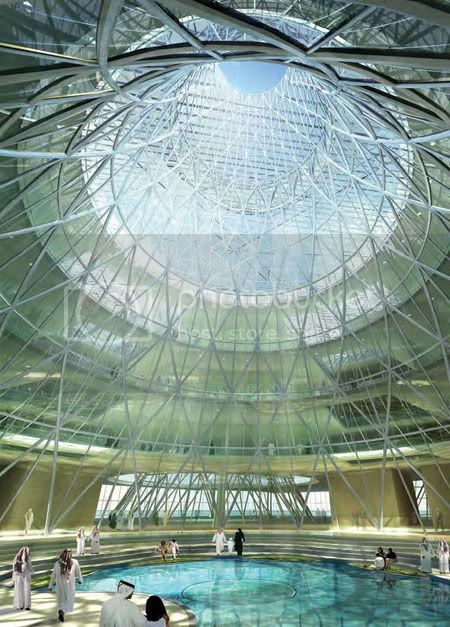 The Masdar Headquarters building will go beyond zero net energy, it will be the world’s first mixed-use, large scale positive energy building. The building will utilize pioneering, never-before-seen technology in the creation of the aesthetically astounding, functionally proficient and experientially superior development that will represent the city. 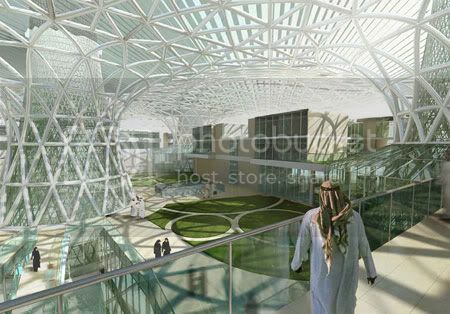 The building takes it cue from the centuries of indigenous architecture, marrying historically successful building strategies for the climate with the latest technology and innovative building systems, including some developed especially for the Masdar Headquarters. 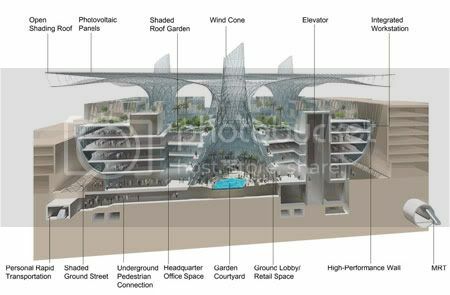 The design, which includes numerous systems that will generate a surplus of the building’s energy, eliminate carbon emissions and reduce liquid and solid waste. The complex will utilize sustainable materials and feature integrated wind turbines, outdoor air quality monitors and one of the world’s largest building-integrated solar energy arrays. Compared with typical mixed-use buildings of the same size, the Headquarters will consume seventy percent less water. Modern wind towers, one of the building’s references to traditional Islamic architecture, are the basis for a number of features in the complex design. They act as wind towers, exhausting warm air and naturally ventilating the building, as well as bringing cool air up through the subterranean levels of the city below. The cones maximize natural daylight throughout the building; the operable windows on the cones allow occupants the option of naturally ventilating interior spaces. Structurally, cones support the building’s roof and allow for the creation of a shaded ground plane on the top of the building. Spatially, they create garden courtyards at the public realm which have pools of light and water. Each courtyard is programmed differently, providing amenities and public space for occupants. The building is designed to be sustainable and efficient from the beginning of construction. 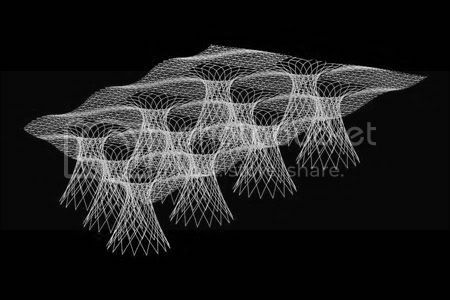 The building cones and roof can be built first, creating a shaded micro climate for the remainder of the construction. The roof, covered with photovoltaic panels, will provide enough power to build the rest of the building. The building includes office and residential spaces, retail and public gardens, as well as a prayer hall and direct access to the city’s transportation systems. Plans for this building were shelved in late 2009 for poor planning and cost overruns.